Nothing interesting to offer comment-wise so I'll go with Happy Wintering! And if i'm not on Facebook at all, does that make me a hopeless cretin? Despite my love of Buffy The Vampire Slayer (yes, really) I actually don't like horror and zombies in particular creep me out. That said, that Zombie app looks kind of fun...I can't believe I just said that. And lastly, I have a "boy job". Which I was encouraged to get into by a male computer studies/math teacher and my Dad. My Mom was a little scared/intimidated by the idea, but she warmed up to it once it became evident that I do well in this field. As I was typing that last bit, I found myself remembering times when female friends have been introducing me to someone and they usually say something along the lines of "She works with computers. She's brainy." One of those being a friend of mine who is a chartered accountant - she's not dumb herself. Some men give me a blank look too when they hear what I do. So I don't know that it's completely a gender thing. Hmmm, you're on my facebook page, what does that say? Great links as usual, glad you landed safely. Thanks for the link Crabby! I love the look of that Zombie run game. Very nice promotion for you in SHAPE Magazine. I love the picture, but don't, for one minute, believe you ate that cupcake. Love your blog. 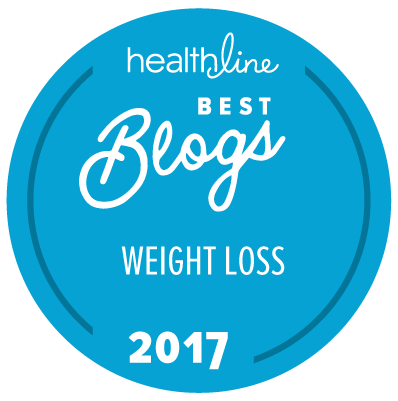 I actually found it reading Shapes list of best health and fitness blogs. As for FB friends, guess I am in trouble although I limit mine just due to fear of getting weirdness & not being big like some of the other bloggers, I don't get the traffic that warrants it. Have fun at Dole & the massage! I could use that! 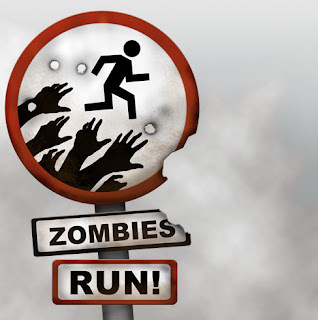 I LOVE that Zombies run game....it is like running with a Farmville type of feel....so cool! Thanks for the heads up. Ha! Looks like you left just in time to miss the Halloween storm. Also, I have a job in academia which is stereotypically thought of as a boy job, but statistically is actually a girl job. So what does that mean? Hmmm. Hey Sprudie, thanks for the probiotic info and the weather report! We managed to arrive in ptown Memorial Day weekend, have a summer and fall of nearly perfect weather, and then depart right before it all went to hell again. Best timing evah! Alas, I think the zombie app is still in development, but I'm looking forward to a report when you get a hold of it. Winters are great. Festive season decorated streets, lights and what not. Wish you have a great winter too! Im so sad Im missing you at Dole!! BUT look forward to yer DOLEmusings. Glad you made it safe and sound! Love the picture of you in the Shape article. Is ranching considered a boy job? Amazing! Very funny, everything is valid when it comes to motivation for exercise, the results worth!! keep blogin, it is awesome! Thank you so much for posting the link! I found lots of fascinating stuff in your blog. From the a lot of comments on your articles, I suppose I'm not the only one! continue the actual amazing function.